The Lion King: Simba Roars! With the dramatic success of "The Little Mermaid" (1989) and "Beauty and the Beast" (1991), Disney was on a roll. The Disney Renaissance was in full swing. What to do next? "The Lion King" (1994), one of the last films made using only traditional animation techniques, was Disney boss Jeffrey Katzenberg's brilliant answer. 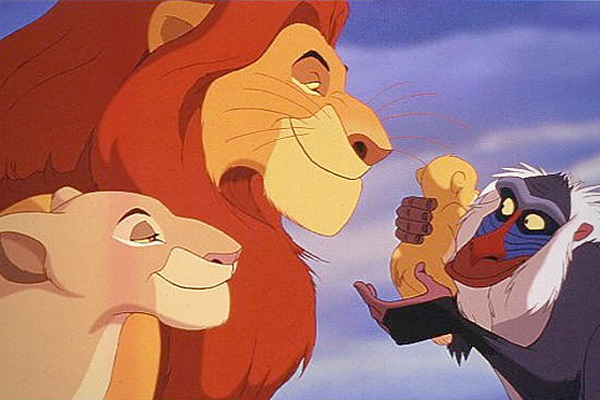 In "The Lion King," directed by Roger Allers and Rob Minkoff and loosely based on a traditional African story (and bearing some marked similarities to Tezuka Productions "Kimba the White Lion"), Simba (Jonathan Taylor Thomas and Matthew Broderick) is an African lion prince. All of the animals of the Pride Lands respect him, and he is beloved by all. 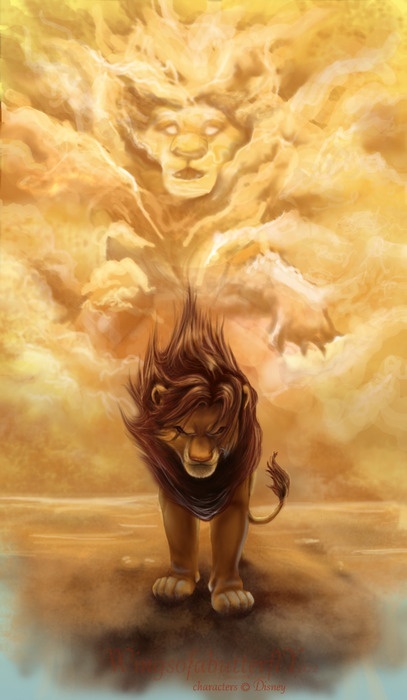 His father is King Mufasa (James Earl Jones), and when King Mufasa dies, Simba is next in line to become King of the Pride Lands. 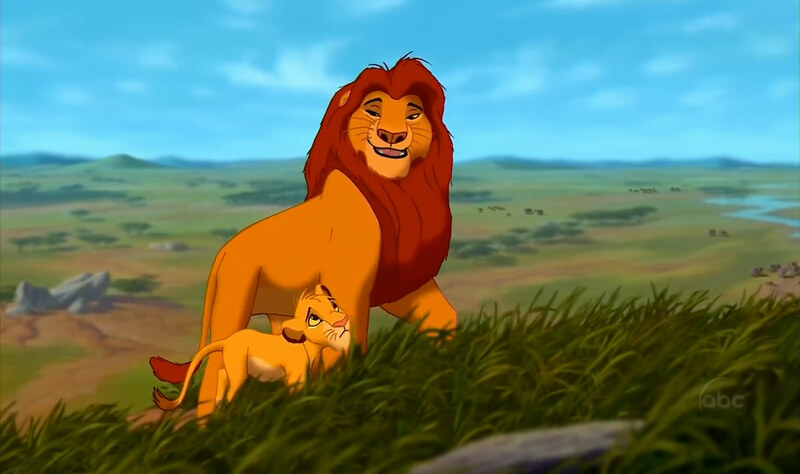 Mufasa and Simba, happy together in "The Lion King"
Mufasa's brother, Scar (Jeremy Irons), wants to be King. He is jealous that Simba will inherit the throne instead of him. He knows, though, that if both Mufasa and Simba were to disappear, he would become King. Stampede! The hyena stampede is a scary moment in "The Lion King"
Scar causes a stamped of hyenas that leads, with direct assistance from Scar, to Mufasa's death. He then pins the blame on Simba, who believes him and, remorseful, leaves and intends never to return. Naturally, Scar then becomes King. Scar talking to impressionable young Simba early in "The Lion King"
Timon the Meerkat (Nathan Lane) and Pumbaa the Warthog (Ernie Sabella) find Simba, who appreciates their assistance and companionship. He grows up, and eventually takes matters with his uncle into his own hands for a most satisfactory conclusion. 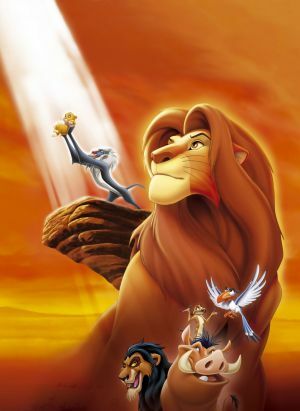 Heroic shot of characters in "The Lion King"
"The Lion King" is a rousing adventure, with an almost Shakespearean ("Hamlet") storyline that you don't often find in animation (insiders called it "Bamlet" because of the mix of kid-friendly creatures and fratricide). 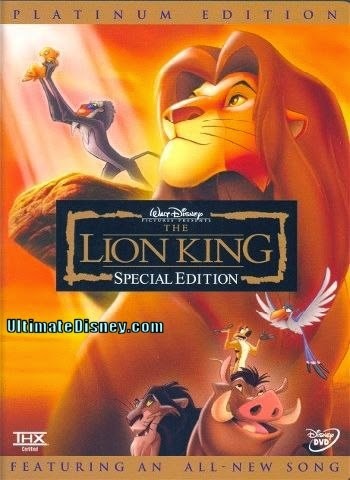 Hidden in "The Lion King" is a marvelous soundtrack. Elton John and Tim Rice (both partially uncredited) wrote several songs included in "The Lion King" score (and, later, more for the Broadway play and the Platinum Edition DVD release), the ubiquitous Hans Zimmer does a terrific job with the incidental music in "The Lion King," and veteran song and dance man Nathan Lane (also partially uncredited) performed many tunes in "The Lion King." Nathan Lane, of course, is a long-time Broadway star with a terrific voice who makes relatively few film appearances. Rowan Atkinson ("Mr. Bean"), who plays Zazu, also performed several songs in "The Lion King." Nathan Lane and Matthew Broderick, of course, later had a big future together in Hollywood and on Broadway in Mel Brooks' "The Producers," and "The Lion King" also turned into a smash Broadway Musical. Crossing a bridge in "The Lion King"
The voice work in "The Lion King" is terrific. James Earl Jones makes King Mufasa resonate, Matthew Broderick is his usual winning "Ferris Bueller" self, and Nathan Lane keeps the hamminess toned down. I will note that at times, I hear James Earl Jones and I hear Darth Vader, but that may just be me. Disney was making "Pocahontas" at the same time and focusing its main energies there, which is kind of funny in hindsight given how the two Disney movies turned out. 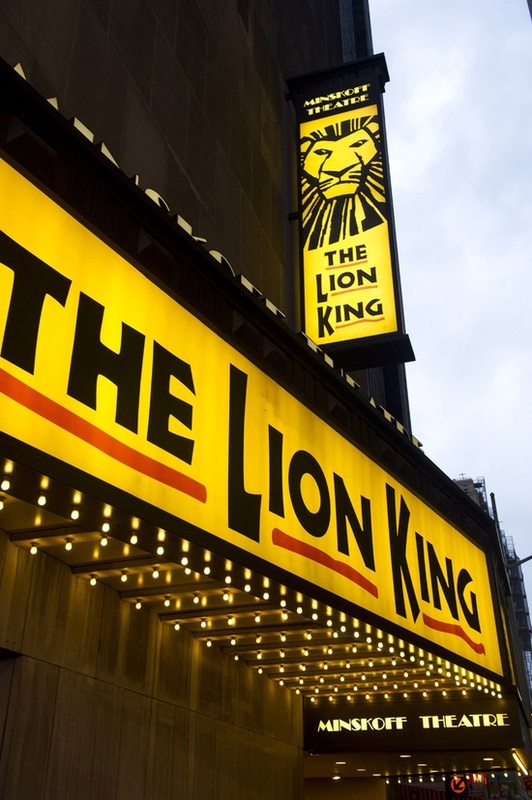 "The Lion King" was the backup which went out on stage and became a star, just like in "42nd Street." Just goes to show the unbelievable depth of talent on the Disney bench that found expression in "The Lion King." 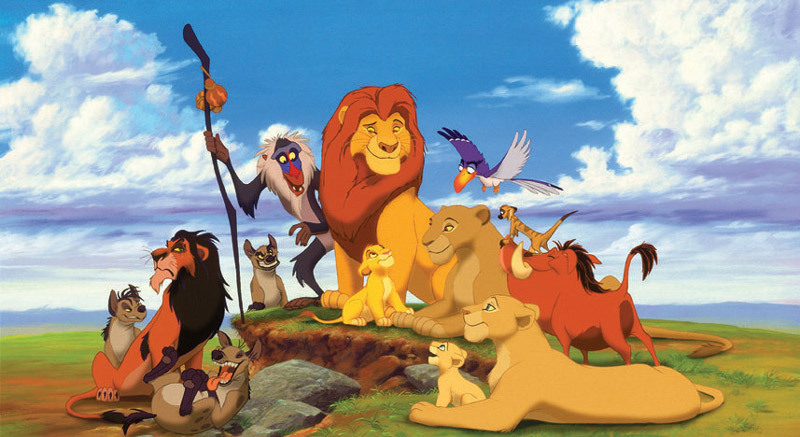 Our cast of characters in "The Lion King"
"The Lion King" still holds the record for the highest grossing traditionally animated film in history, and continued interest in "The Lion King" is the best selling home video of all time. In terms of its artistic and commercial success, the film is just a phenomenon, and some consider it the climax to the "Disney Renaissance" of the 1990s. 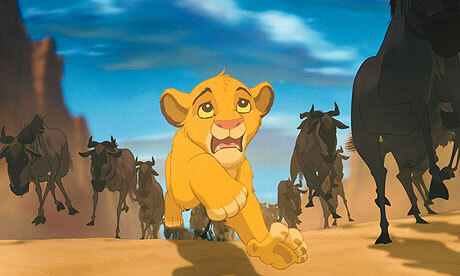 "The Lion King" is a fun adventure for everyone in the family and led to two (at last count) high quality sequels. 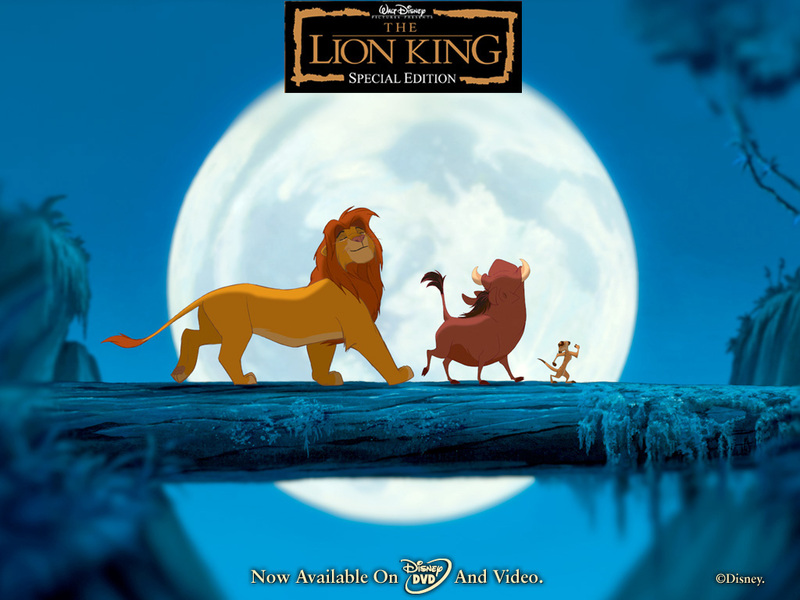 Every fan of animation should see "The Lion King," and you can get the entire "The Lion King" trilogy in one attractive Blu-ray boxed set for the full experience.